Born in Bukavu, Mwezé Ngangura is something of a veteran in Congolese filmmaking. 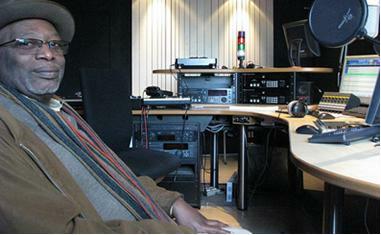 His two short films, Tamtam électronique (1973) and Rhythm and Blood (1975) were made while studying in Belgium then on his return to DRC (then Zaire) he became a college lecturer and also made many television documentaries. These documentaries offer a wide angle on life in Kinshasa, including a portrait of the painter Chéri Samba. Ngangura will reunite with Chéri Samba at our PASS pop-up in Paris to discuss Congolese cinema with Jean-Pierre Bekolo. Category: News | Tags: cinema, Congo, Congolese Sounds, Mwezé Ngangura, PASS Paris | Bookmark: permalink.